Everyone is familiar with the members of the NFL taking a knee in protest of what they see as perceived police brutality. The people who respect the military and law enforcement feel that this protest during the National Anthem is an insult to our country, to our flag and to those who serve it, are killed or injured for it. I had these bracelets made as our counter protest. I designed them and had them made. They are adult sized and comfortable to wear. For every bracelet that I sell, I am donating $1.00 to The Wounded Warrior Foundation. This is a wonderful charity that cares for and helps rehabilitate the men and women that served our country in the military to their physical and mental detriment. 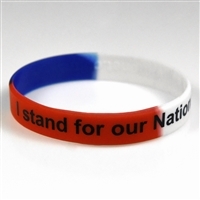 The bracelet reads "I stand for our National Anthem" printed in black on red/white/blue silicone bracelets. The inside is embossed "God Bless America"